Then someone at WABA got a pretty darn great idea: they decided to move the ride up to mid-November. So I signed up to ride the 47-mile option. The ride began (and ended) at the Dew Drop Inn. This bar is located along the Metropolitan Branch Trail and immediately next to railroad tracks. It is an old building with a shipping container attached. I think one could say it has character. I arrived about 40 minutes early thanks to non-existent traffic. Michele, the WABA events coordinator, was working with a scruffy crew of unscruffy women (including Sarah, another WABA employee, and volunteers Leslie and Sam) getting the ride’s check in area set up. I helped a little, got my cue sheet and headed out. The course took us on city streets through middle-class Northeast Washington and into neighboring Mount Rainier, Maryland. Soon we were on the Northwest Branch Trail which follows the northwest branch of the Anacostia river. We traveled north-ish. I had my fingers crossed. Every other time I’ve ridden this trail system I’ve gotten lost. Thanks to many, many well-placed arrow signs, I managed to get only mildly confused a couple of times. One of these befuddlements came because a sign had been blown down. Did I mention it was windy. Well, now you know. We kept following the trail and the occasional road mostly through College Park until we were all dropped on the outskirts of Greenbelt Maryland. There are hundreds of acres of agricultural land used for research purposes by the Department of Agriculture. The roads are pretty darned nice for cycling. So we cycled. We rode into the National Wildlife Federation property for a two mile loop through the woods with hardly any auto traffic. This was sweet. We returned through the Ag complex and into Greenbelt. From Greenbelt we wended our way back to College Park for a short ride on the very nice Trolley Trail. Next up was my big goof of the day. After the Trolley Trail we jumped on Route 1 and I took a right onto the Northwest Branch Trail instead of a left. After about 1/2 mile I came upon a course marshal. He told me I was off course and led me back to the point of my mistake and soon I (and the dozen other people who also goofed) was on my way to majestic snow covered Mount Rainier Maryland. (Just kidding. No snow. Just can’t figure out why this town has such a peculiar name.) The rest of the ride was an approximate retracing of the first four miles of the route. The Cider Ride route is almost as complex and mysterious as the 50-States Ride. This is an incredible achievement made possible only by WABA’s proprietary RRGS (random route generation software). I have heard that NASA is considering using it for a mission to Mars. There were two pit stops along the route. The first stop was at the 12 mile mark outside Proteus Bicycles in College Park They had warm cider and a ludicrous amount of granola bars and donuts. I felt health conscious and had a cup of cider and a Boston cream donut as I walked to Nelle from WABA. Nelle was in her usual good spirits despite the fact that the wind was threatening to blow her entire pit stop away. She reminded me as I parted that getting lost on a ride this complex is inevitable. You just have to go with the flow. The second stop was at a park in Greenbelt. Here I selected the healthful choice of hot cocoa and apple pie. I spent a few minutes talking with Colin another WABA staff person. Colin’s bike is an touring bike that seems to have been set up by Dr Frankenstein. Or, considering its ability to carry thermoses, Juan Valdez. The circuitous route made it hard to tell when you were going to get a tailwind, headwind or crosswind. 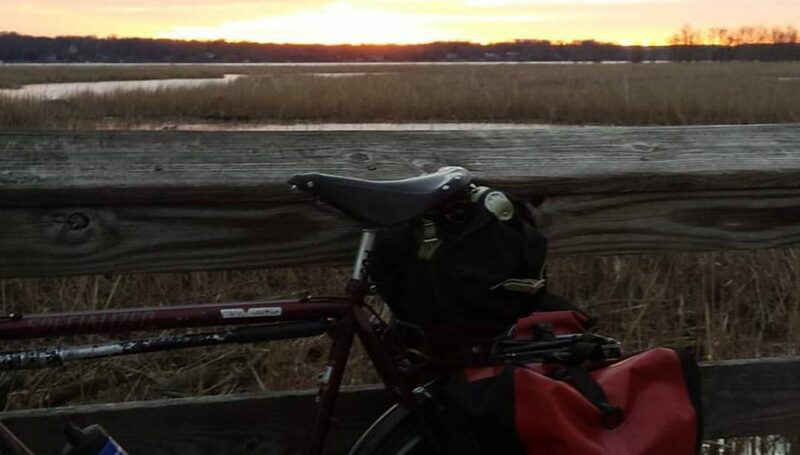 I assumed that anytime I was going more than 20 miles per hour it was because of a tailwind. I assumed that because my legs were dead right from the start. They were the only legs I had so I did the best I could. There was an after party at the Dew Drop Inn. There was beer. I drank some. There were chips. I ate them. There was a burrito. I ate it. There were many people I knew from #bikedc. I didn’t eat them. Just before entering the bar, a young man with a clipboard asked me if my name was on “the list.” I was somewhat surprised to learn that it was. What was this list, I thought? It was the list of people who were given this really nifty mug. 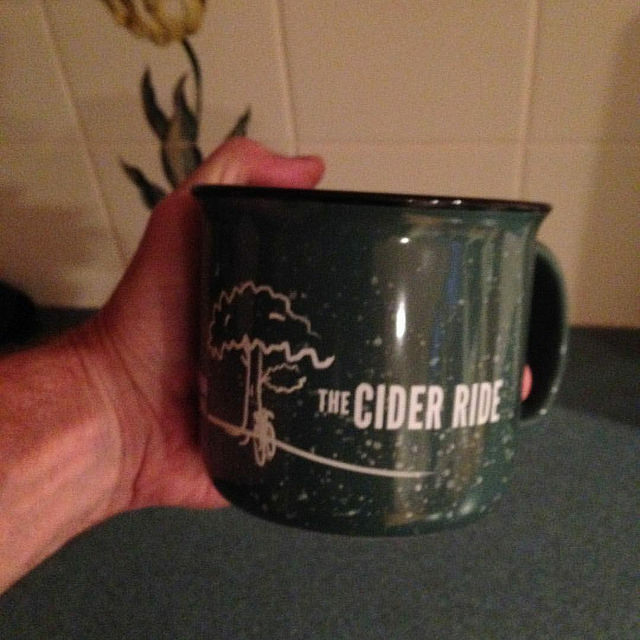 So another Cider Ride is in the books. Many thanks to WABA’s Greg Billing, Nelle Pierson, Colin Browne, and Sarah Katz-Hyman for a great event. Thanks also to the many volunteers who helped out along the course.